The Cure has planned to release a new single on the 13th of every month until September where they will release their new and 13th album (depending a lot on how and what you count). The first single "The Only One" is out now and it has a sound that is pretty close to the one found on the "Wish" album. Unfortunately the boys have forgotten to write a melody for the song. It is very much a The Cure throw-away and we can only hope that they've saved the good songs for last. Unfortunately the B-Side "NY Trip" isn't any better. 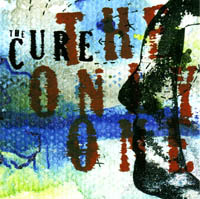 It's been a very long time since The Cure has made a great album and I'm afraid this first single doesn't give much hope that this will change anytime soon. But we'll see about that later.